One of the great light heavyweights of all time, Archie Moore, a.k.a., the “Old Mongoose,” was born under the name of Archibald Wright on December 13, 1913 in Benoit, Mississippi. Archie turned professional in 1936, originally operating in the middleweight ranks, but ultimately moving up into the light heavyweight class by 1945. He fought a total of 222 recorded bouts over more than 27 years in the ring. He campaigned against most of the toughest men in the business during his long career, posting 187 wins, including 132 knockouts, against only 23 losses and 11 draws. Moore campaigned for 16 years before gaining an opportunity to fight for a world championship. On December 15, 1952 he became the Light Heavyweight Champion of the World at age 39, defeating Joe Maxim by a decision in fifteen rounds, thereby becoming the oldest light heavyweight champion in history. He defeated Maxim twice in rematches and was nearly unbeatable as a light heavyweight, successfully defending the title nine times, and holding it for almost a decade before finally being stripped of it in February of 1962 for failing to defend the title within the required period of time. In 1955, just four months shy of his 42nd birthday, Moore attempted to win the heavyweight title from Rocky Marciano. He decked Marciano in the second round, coming seconds from snatching the coveted title away, before the younger champion recovered and came back to knock him out in the ninth round. Just weeks shy of his 49th birthday in November of 1962, Moore also fought a promising young heavyweight by the name of Cassius Clay, who later changed his name to Muhammad Ali, losing to the future self proclaimed greatest of all time by way of a fourth round knockout. As a result, Moore became the only man who could lay claim to having faced both Rocky Marciano and Muhammad Ali professionally in the ring. 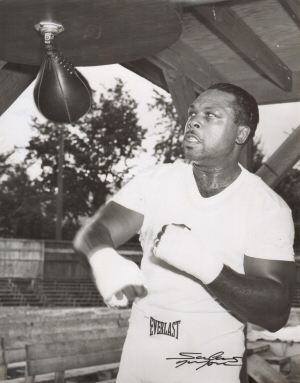 In retirement, Archie remained active in boxing as a trainer, working with a young Ali, and later with heavyweight champion George Foreman among others, while traveling the world as an ambassador for the sport. He was also very active with working with youth, frequently lecturing them against the use of drugs. He was inducted into the International Boxing Hall of Fame in 1966, and Ring Magazine in 2003 named him the fourth best puncher of all time.